Dynamic Dinosaurs sound their surroundings! We are happy to share our “Sounding our Surroundings” products with us! We enjoyed collecting some leaves before we start to it. Then we focused on sounds we hear while we are sitting or playing in the garden. 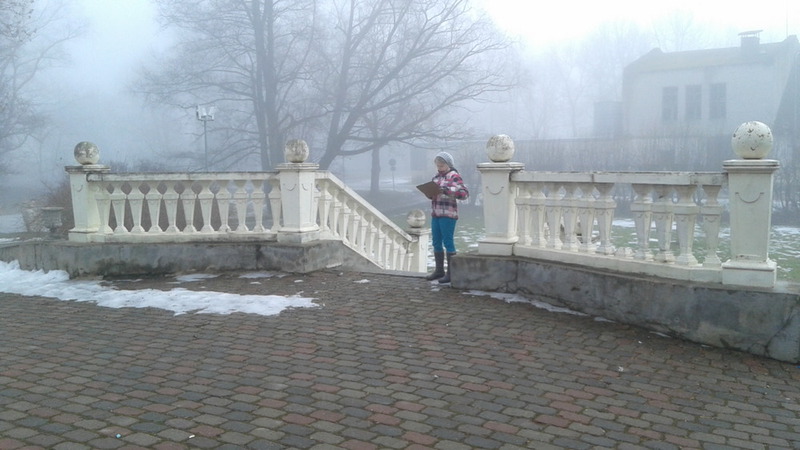 After that we started our Project at the tables and try to focus on sounds around us. 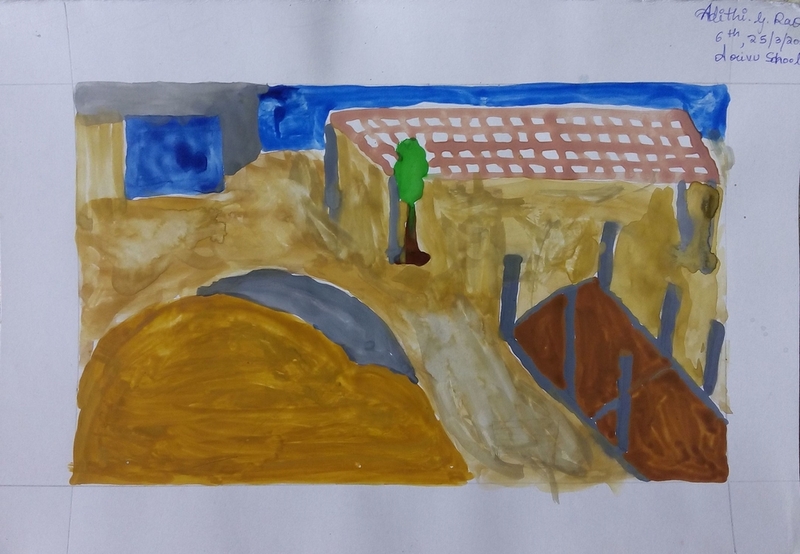 When we hear noise we preferred to paint fast, when we hear quite sounds we paint slow. We also change our painting styles depending on sound level too. 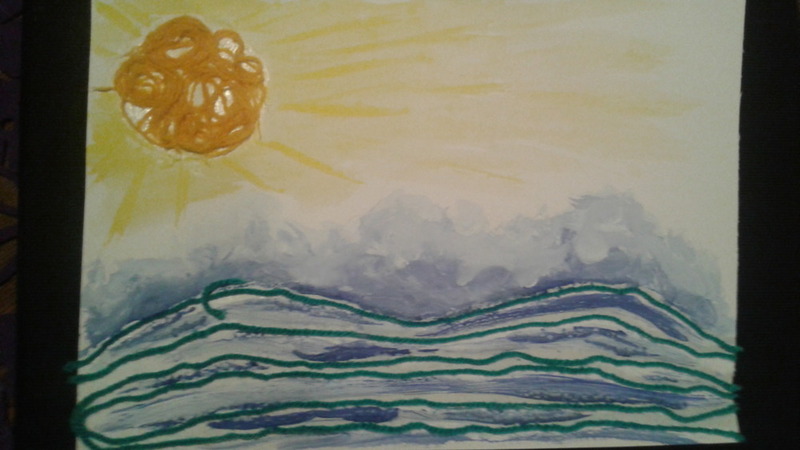 Such as some of us painted more circular when it is noisy and painted straight lines when it is quiet. 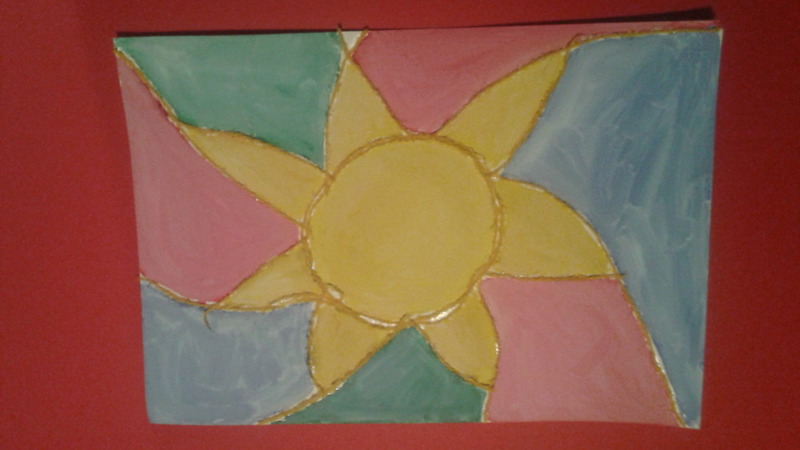 We enjoyed painting with the leaves and we hope you’ll like them as much as we do! 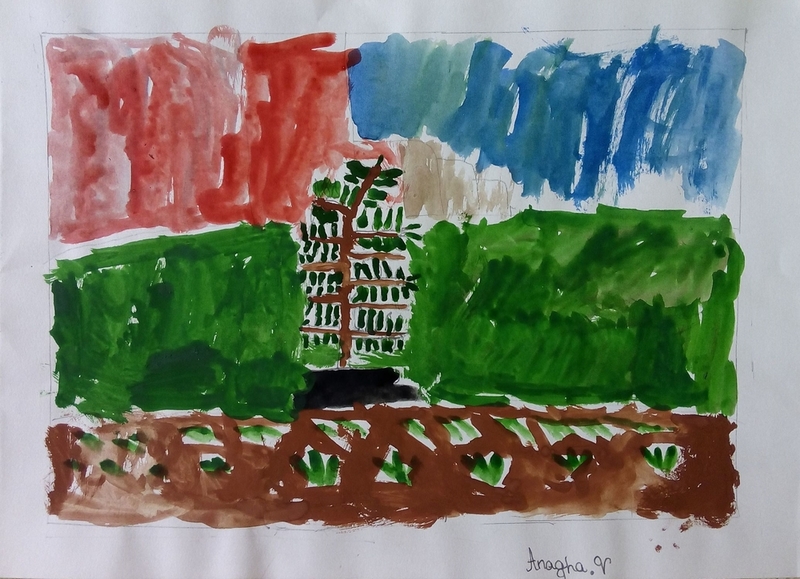 The 4-5 year old Dynamic Dinosaurs from Açi Preschool in Istanbul, Turkey are making and sharing art with the artists from Praxis School in Mysore, India. We are finishing our 1st semester here in Istanbul, Turkey. So we’ve been busy all these weeks but of course children were excited to hear about the new project of Dear You Art Project. When the teachers informed them about the new project, the children got excited in learning about atmosphere. 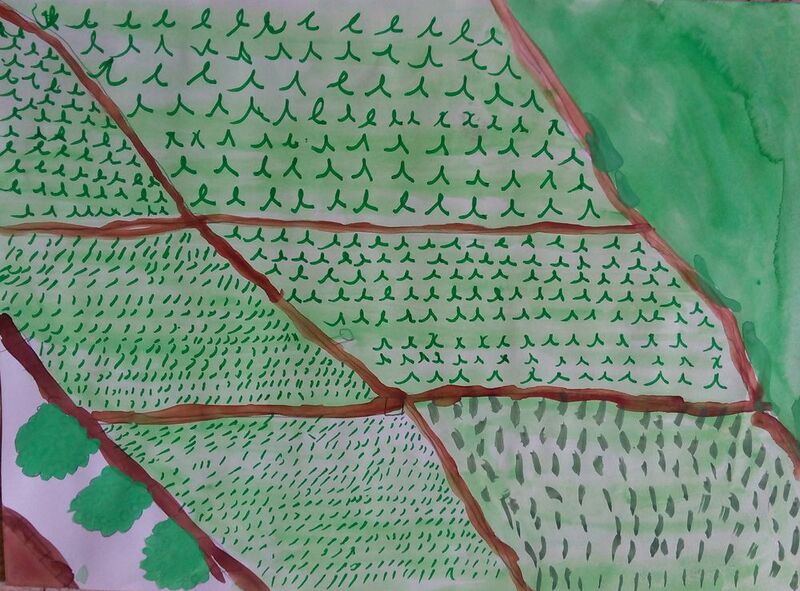 Some of the children drew some zig-zag lines, some of them drew curly lines and some of them did their own design on it. They also told many creative stories related to their drawing which were written at the back of their drawing by the teachers. We sent our work to our friends in India and are waiting for their work too! We enjoyed making this project and we hope you’ll like it as much as we do! 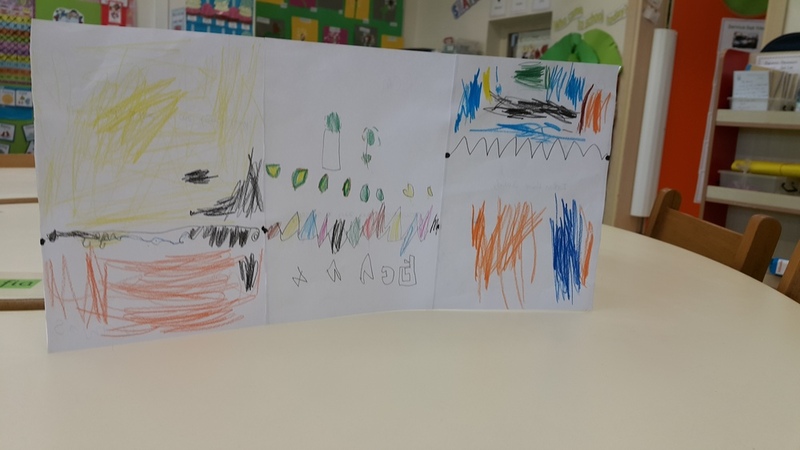 The Dynamic Dinosaurs from Açi Preschool in Istanbul, Turkey are making and sharing art with the artists from Praxis School in Mysore, India. 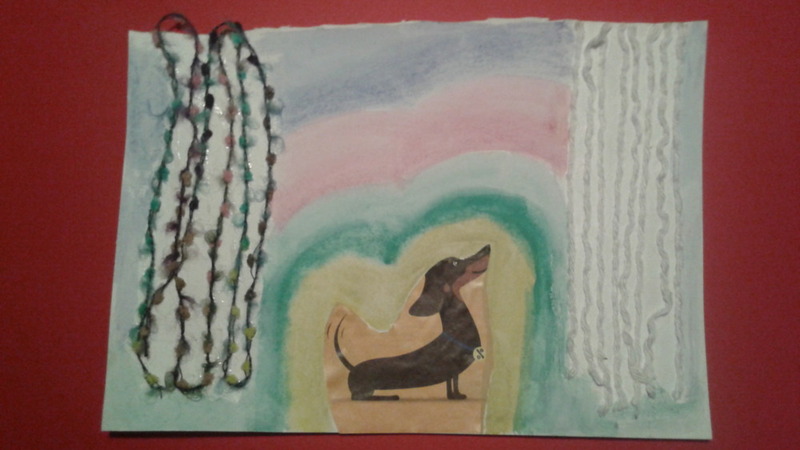 Both groups of artists are aged 4-5 years old. Hooray! We got a school in India and we sent our 2 projects today, we look forward to see our friends’ work in India. Children were surprised to see the Pop-up cards and when we introduced them that they will make their own places for their puppets which they did before, they immediately start to think and ask questions about it. Some of the children wanted to choose 1 or 2 different house(s) and did their own decoration for the place. Some of them remembered that they made an animal as an imaginary friend so they preferred to do designed it by drawing the animal houses and the details. We enjoyed making pop-up places for our imaginary friends and we hope you’ll like them as much as we do! We wish you a “Happy New Year”. 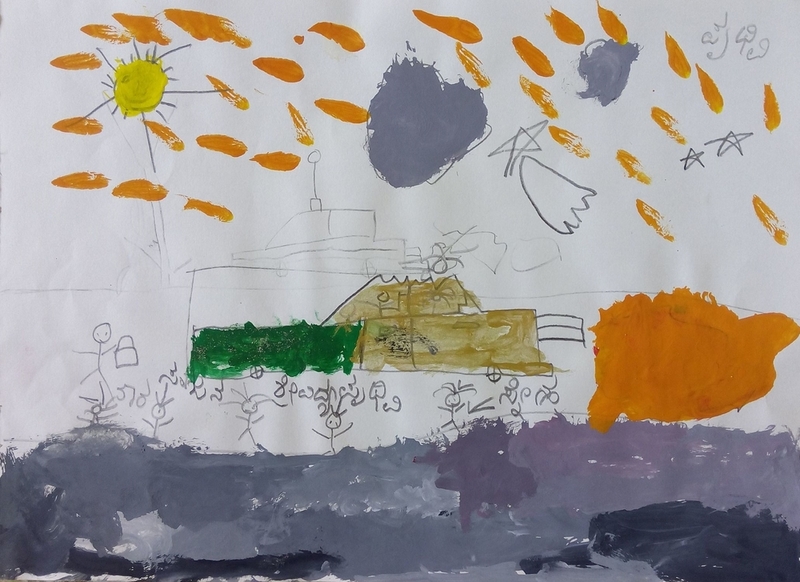 he 4-5 year old Dynamic Dinosaur artists from Açı Preschool in Istanbul, Turkey are making and sharing art with the young artists from Praxis Foundation in Mysore, India. Kashyap imagined an 'Ice Dragon' in Finland. He strongly believes that there still are massive dragons, like those of yore, hiding deep in the frozen forests and mountains in Finland. Janak started with the idea of making a female 'Yeti', he spoke a lot about it and finally got to the make Yeti instead. Shayan is from Maldieves, and is quite fascinated with the Indian traditions, so he made this marriage couple fully decorated puppet. This is the kind of wedding that he wants to have!!! Laisa is attracted to water like a fish, when on field trips she refuses to get out of the water hole. Her favorite animal is a fish. She has a lovely fish tank at home and takes care of all the fish pretty well. She started making a mermaid but then changed her mind to make a fish puppet. Taara is found of animals, expecially dino's, she had recently watched the Jurassic world with her parents and wanted to make a 'Steggi' puppet, this dino is a friendly, grass eating dino that helps humans when they are lost in the forest. Taara also made a 'Jolly Dolphin' which is, according to her the princess of the ocean. That is why her skin is all shining and glowing. Like the dino the dolphin in a friendly creature who speaks with children and plays with them on the beach. Jolly even takes children for a free ride on the waves. Manjunath is fascinated by the traditional Dasara Festival that happened in Mysore in October and wanted to reproduce the heavily decorated animals that were paraded around the Mysore Palace on the 10th of October. He particularly liked the veeerytall donkeys and farming oxen that were paraded. These animals were brought into Mysore especially for the Dasara Festival from the northern part of Karnataka state. Manha is a 6 year old girl child who loves DORA and here adventures, she believes that she is on a wild trip with DORA while making the puppet. She was all chatty and explaining to the rest of them the things that she and her friend were together discovering together. 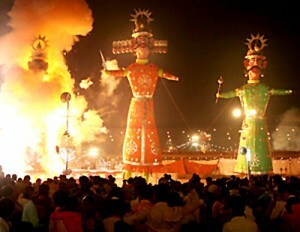 Sharil was horrified by the Dasara Puppets that were on display for 10 days in Mysore and which were burnt down to indicate the victory of Good over Evil. She wanted to share this demon character from the Ramayana (Hindu Mythology) who kidnaps a King called Rama's wife to an island which is today's SriLanka, with all her friends in Finland. She has a message as well BEWARE!!!!!!! Kishore is a Class II child who is always looking for something interesting. Recently he discovered the story of Ganesha, who was punished by his own father but saved by his mother. Ganesha is his most favourite character from the Indian Children's Stories. Kishore believes that Ganesha can read and write at great speed because of his large head and long trunk. He thinks that Ganesha can also listen to two people at the same time because he has elephant ears. Nandana is a Grade I child and her friend is a flying witch. This friend of her's is a special witch as she is able to fly around the whole world with Nandana on her back. So Nandana comes to school even flying on her back!!! Palguni made this humming bird puppet, which is carrying a pretty dried twig to build its nest. 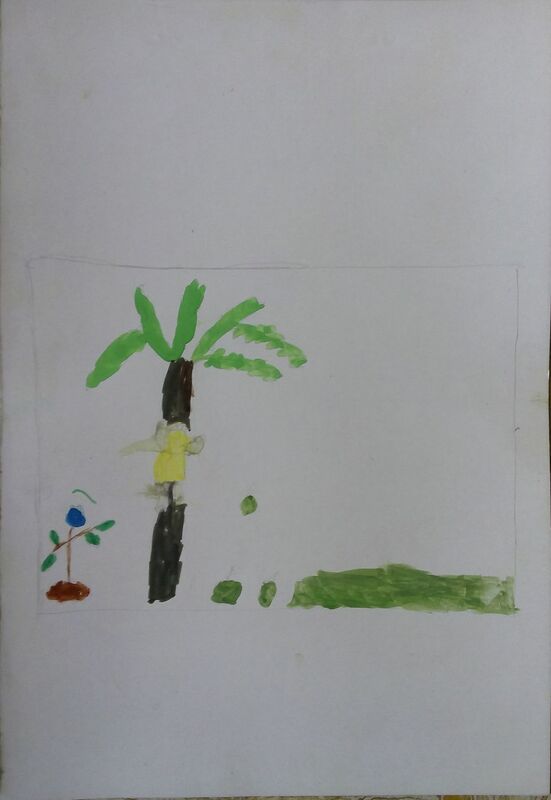 Palguni was on a field trip from school where she saw a lot of bee-eaters making nest on tall coconut trees. She was inspired by this and wanted to make a humming bird puppet which she finds very colorful. 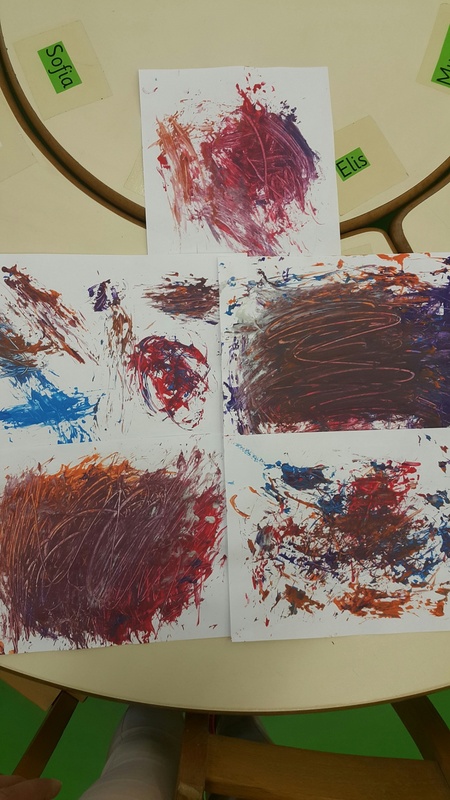 The artists from Praxis Foundation in Mysore, India are making and sharing art with the 4-5 year old Dynamic Dinosaurs from Açı Preschool in Istanbul, Turkey. "IMAGINE ME" India and Finland are friends! "Imagine a friend, a counterpart to you in far away Finland, Imagine the looks of this friend, the things that she/he likes, where she/he studies, with whom she/he lives, where she/he studies, how she/he spends free time and so on and so forth. Now we need to recreate this FRIEND in the materials provided." Initially there were questions as to how big the creation should be and depending on the materials we decided to make masks of the FINLAND Friends and improvise on them at a later point in time. Project Implementation: Each student paired up with one teacher for assistance and worked on the masks. The discussions during the process of making the masks were quite interesting and revealing the thought processes of children involved. There were a lot of questions about Finland itself, how far it was, how big it was, and was it a cold country? And how tall were people etc, etc,. As a response to the queries, one teacher browsed the net for information on Finland andshared it with students. Students started to relate the conditions to their own context here and started the project on that note. To read the full report on the workshop and to see pictures of the amazing artworks, please click here. 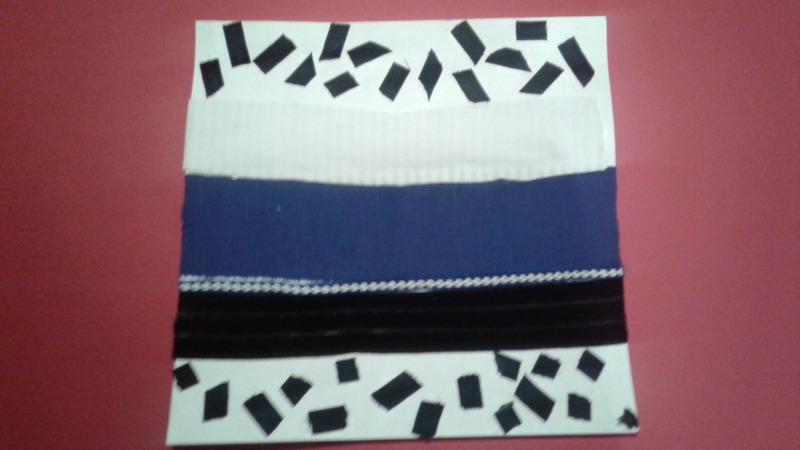 Leena Pascal and her talented group of artists and teachers at Praxis Foundation in Mysore, India are making and sharing art with Eliisa Sorvali and her artists at Annantalo in Helsinki, Finland. The Monkeys have found their other calling as comic artists! From the looks of their character studies they have a great handle on how to convey emotions and feelings. Lotta drew a story that will happen over the summertime. Lotta's big sister will have a birthday party and she drew how the event will go. Let's all go! Olivia drew all the things she would like to do this summer such as swimming, going on an airplane (lentokone) and playing on the swings. Lumina's character study turned into a perfect way to learn Finnish! Our friends at Arivu School in India are on summer holiday now, but when they'll return to a package of comics from the Monkeys :). Have a beautiful summer holiday, everybody! In Finland, the change in light is one of the biggest differences we feel when moving from winter to spring. The Monkeys used the beautiful sunshine to make their artworks since this is one of the best things Finland has to offer right now! We first talked about how to draw profiles and then experimented with different silk papers and paper cutting techniques. Some of the Monkeys got very detailed when drawing their profiles while others liked to add more collage and layering techniques into their pieces. Either way, the results are amazing and I hope our friends in India will like them too :). From palm trees and rice friends in India to you! It was very hot and sunny today at Arivu school. The summer holidays are already starting here as you are entering spring. Around Arivu school there are some rice fields and many of your friends chose to see them through the viewfinder. 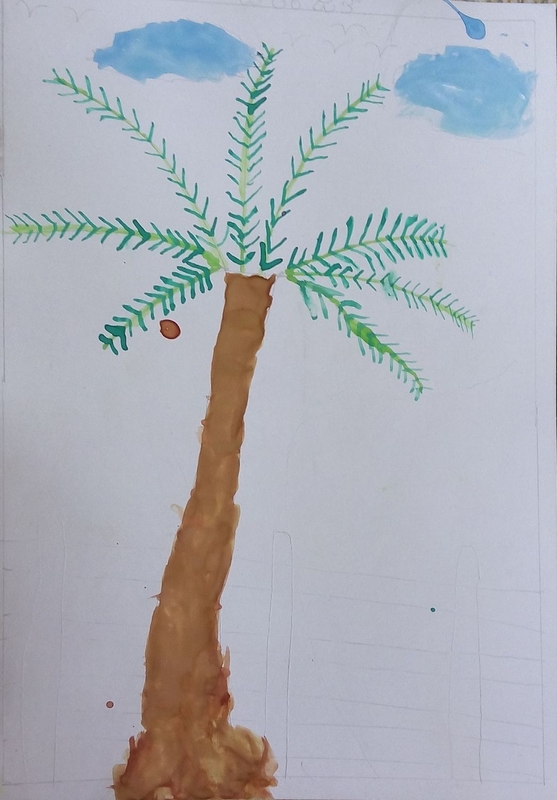 There are also palm trees and other types of trees as you can see in the artworks. 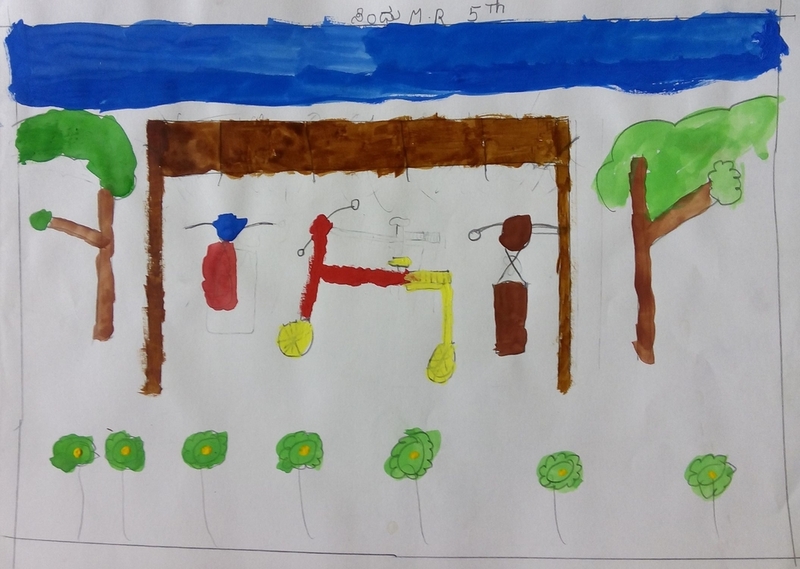 The playing area of the school as well as the school buildings have also found their way to the artworks. Before going for holidays, they will make an art exhibition of your February artworks. They are all looking forward to see them and know you all. We were so excited to receive our first package from our new friends in India! Aniish asked, "How can you draw that good?!" Ella asked, "Do you like the Monkeys- the animal and us?" Dante asked, "Is the boat in your painting going to Sweden?" The Monkeys were discovering all special angles of their classroom with the help of their newly crafted viewfinders today. 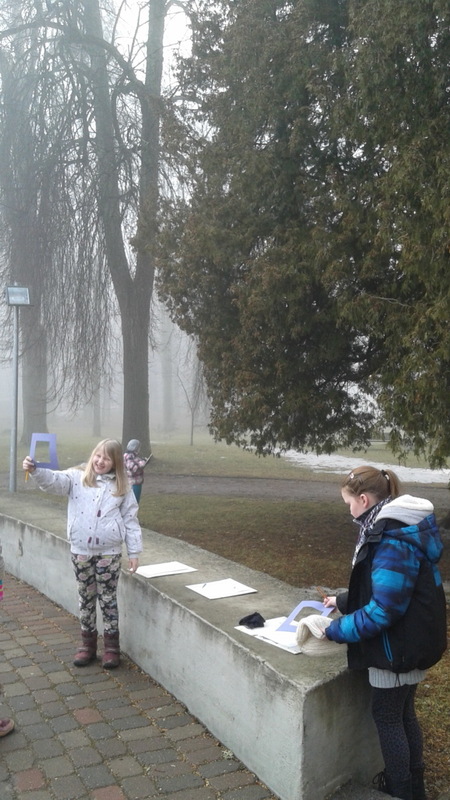 The viewfinders also helped us build a better composition. 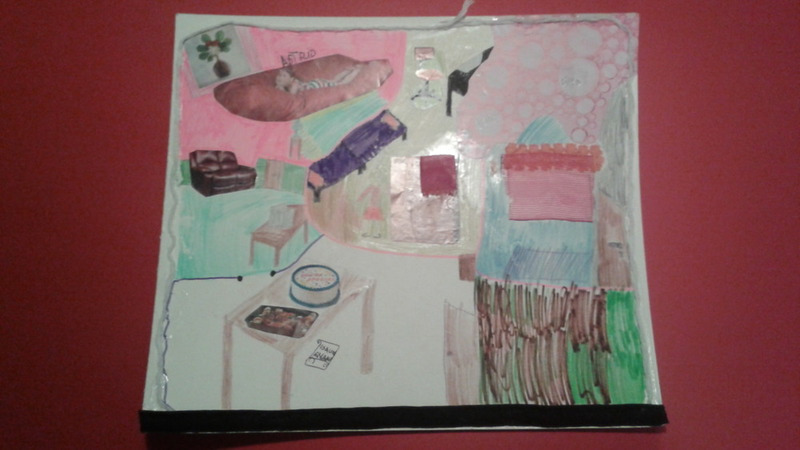 Have a look at their paintings and then see if you can find where they found it in their room. It doesn't surprise me that there are a couple of watercolor paintings of fish and monkeys! Can you see why? The Monkeys String their way to India! The Monkeys are super excited about meeting their new friends in Mysore, India! 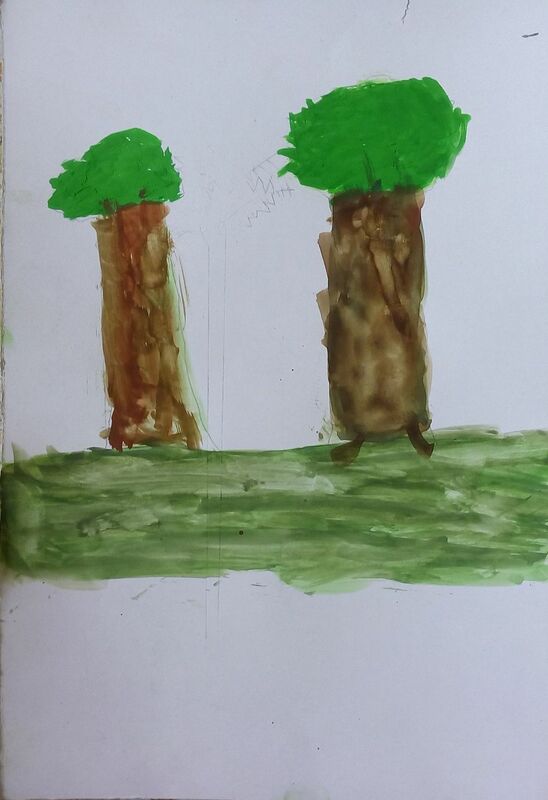 Since this is their first piece of art to exchange, some of the Monkeys were trying new visual techniques on how to bring our worlds together. 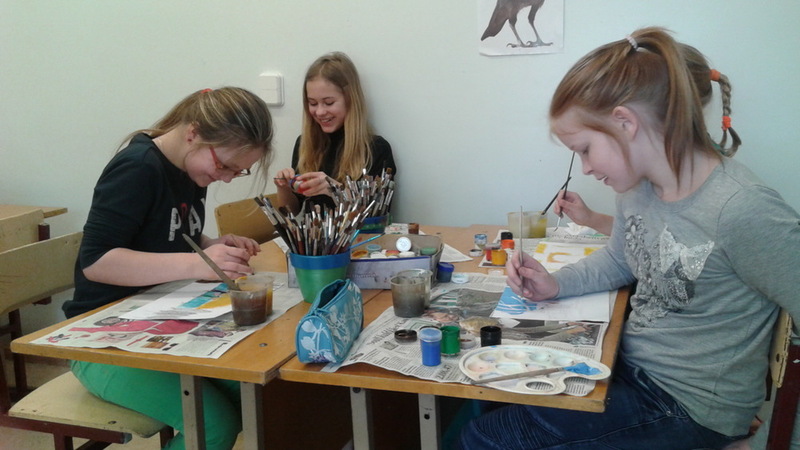 For example, Niklas and Lotta drew the Indian flag and Finnish flag on their paintings. Patrick and Hartti drew games that they like to play. Everybody enjoyed sharing a part of themselves with their new friends! Have a great Dasara Fair in Mysore! Wishing our Dear You friends in Mysore, India a Happy Dussehra on October 3rd! "In the months of Ashwin and Kartik, Hindus observe a 10 day ceremony of fast, rituals and celebrations to honor the triumph of Lord Rama over Demon Ravana. Dussehra also symbolizes the triumph of warrior Goddess Durga over the buffalo demon, Mahishasura. Thus, it is a celebration of victory of good over evil." - Read more about the celebration here. 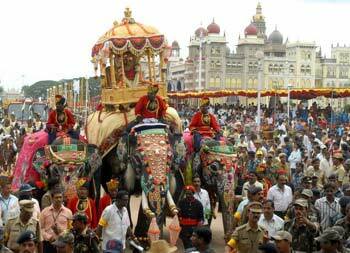 To learn more about how the Dasara Fair in Mysore is celebrated, please click here. I hope to experience this colorful festivity in India one day! Ramlila (Rama + lila) meaning the lifestory of Rama is the melodramatic presentation of Ramayana.